Guest Designers: Jeanne & Kim S.! 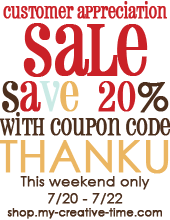 This Customer Appreciation Sale is only good until Sunday, July 22nd, so be sure to get your orders in this weekend! My project today is a sweet little 4x4 card for all the chocolate lovers out there. Now, you might be thinking, Hot chocolate? Who drinks hot chocolate this time of year? Who? THIS GIRL! After cutting my card base, I ran it through my Big Shot with one of the frames from the Stampin' Up! Designer Frames Textured Impressions Embossing Folders Set. I then layered my blue patterned paper (which I cut into a square frame) on top of the card base. 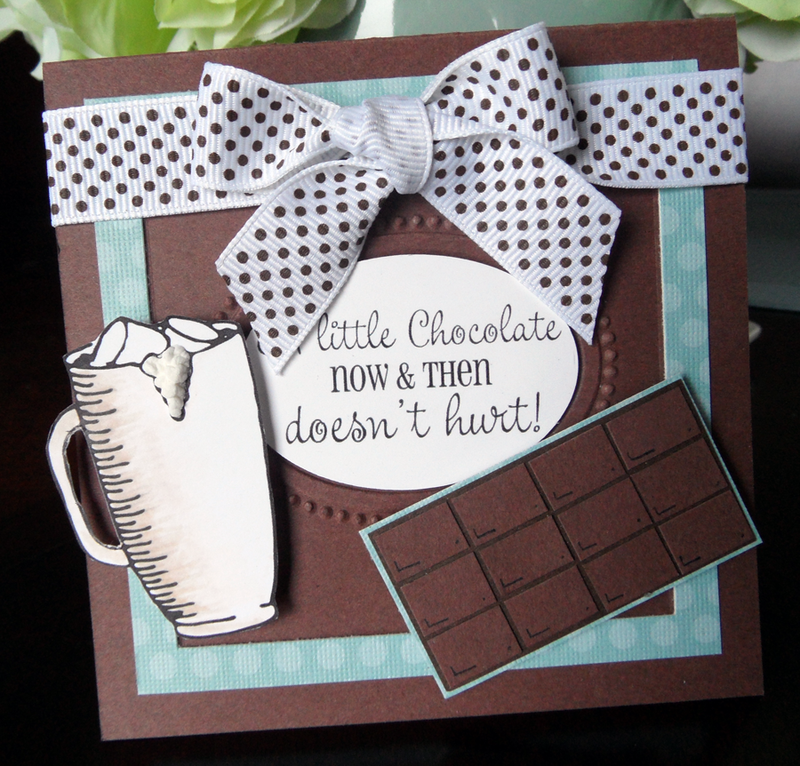 The adorable sentiment and hot chocolate mug are from the Do The Cocoa Motion Stamp Set. I shaded the cocoa mug with my Copics and added Marvy Uchida Liquid Applique to the foam spilling out of the top. Liquid Applique comes in a tube (similar to a glue pen). After applying it to my project, I heated it with my heat tool and it puffed up to look like foam. This product is great for fur, frosting, snow and whipped cream! I created the chocolate bar on my own using my paper trimmer and a black fine point marker for the corner marks. After tying my cute polka dot ribbon around the card, it was good to go! I hope you were inspired! ***NOTE FROM EMMA: WOW!!! It looks like SEVERAL of you took advantage of this AMAZING sale already!!! My Mom just informed me that we are already sold out of a few sets! I am going to make those sets available for pre-order so you can still take advantage of the sale this weekend! THANK YOU for making this sale such a success & it's ONLY the first day! HUGE HUGS! Very adorable! I am loving that foam! In fact...just got some. Thank Emma for the coupon. I'll definitely be using it this weekend. Hope her son is better soon! Very cute card. Love the chocolate bar. ADORABLE!!! I love hot chocolate too, and your card is making me want some! Love the color combination too! Your card makes me want some! The chocolate squares look good enough to eat :P Great job on your card. Super cute and Yummy card!! Veronica ~ this is not only BEAUTIFUL but so YUMMY looking! Talk about creative ~ WOW ~ look at your candy bar! OMG!!! I read your post 2 times just to make sure it wasn't a certain cut of some sort! Of course I LOVE the the paper and colors along with that bow! AWESOME & YUMMY card! LOVE, LOVE, LOVE chocolate!...er, this card. It's absolutely delicious! As you just ended your week of guesting at EC, I'm so glad to see you having a turn here today. Thanks for helping Emma out. Emma, still thinking of you, Aaron, and the family! It's so sweet to be thinking of us with a sale. I really love this! The colors I love because the chocolate colors and browns are my favorites to use with this collection of stamps. It always looks so rich and yummy!